The late Dr. Hans Rosling's Factfullness is a great read. Spoiler: The world is actually getting a lot better really fast. You should read the book Factfullness. You are overly pessimistic and you make an assumption that “Mother Nature is all about balance”. Where is there proof of this? There is no such thing as Mother Nature. > also many people don't understand or exaggerate that developed and undeveloped part, years ago i was with a friend of mine and we were talking to some girl from germany for fun, and she asked us "do you in syria have cars and phones like us?" > Level 1: People live on less than $2 a day. Rosling estimates that one billion people are living at or below this threshold. They get around on their own two barefoot feet, cook over an open flame like a cookfire, fetch water in a bucket, and sleep on the ground. This is what most people understand if they hear the word underdeveloped/developing. Basically, tribes and very conservative lifestyles. > Level 2: This is the income group where the majority of the world's people live. They get by on between $2 and $8 a day and might have some possessions like a bicycle, a mattress, or a gas canister for cooking at home. This is the stereotypical view of Eastern Europe, India, Southeast Asia, and Latin America in movies, and while this might be true in those regions for rural areas, most of the people living there are level 3 and 4. > Level 3: This is the second most populous category on Rosling's list, after level 2. People in level 3 live on anywhere from $8 a day to $32. They have running water, might own a motorbike or car, and their meals are a rich and colorful mix of foods from day to day. They also probably have electricity and a fridge, which makes things like studying and eating enough varied nutrients easier. What you were talking about are countries in Level 3. > Level 4: Like level 1, roughly one billion of the world's people live on this level. They make $32 a day or more and have things like running water (both hot and cold) at home, a vehicle in the driveway, and plenty of nutrients on their plate. They've also likely had the chance to finish twelve years of school, or more. Basically, the people who want to help. You're not wrong. The timeframes vary based on what societal dimension you're discussing at a given point, but many aspects of global society are significantly better today than in the recent and distant past. Education levels, equality, access to food, mortality rates, life expectancies, literacy, and so on. I'd you're not familiar with it, I'd recommend the book Factfulness . Pretty good book on this topic of perspective vs reality. >Besides, living centuries only makes sense if chances are reasonably big quality of life will get better. Looking at the planet I think the reverse is plausible. Why? Almost everything for humanity is improving. Check out this website , that covers this topic. It’s not your typical investor book but I’d recommend Factfulness by Hans Rosling. When becoming a good investor the first step is to have a fact based world view so you can make rational investment decisions based on the data & not the hype or emotion. Bill Gates says it’s his top read. É um ted talk do Hans Rosling que simplesmente destrói essa concepção que o mundo está piorando. O mundo (INTEIRO, não só os paises desenvolvidos) nunca foi tão bom quanto hoje. For a broader insight on why poverty is declining and other things are doing much better than we're led to believe, I recommend reading Factfulness by Hans Rosling . 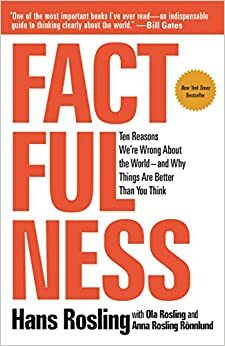 Rosling's last book, Factfulness, tackles 10 common myths (or urban legends, if you wish) concerning the state of the world and how it is majorly improving, directly countering the majority view in the developed world. Buy it at Amazon or Bookdepository (with free shipping worldwide). There seems to be a whole sub-genre of books like this now. Recently I've read Factfulness and Abundance which I both recommend. Now I'm working on The Rational Optimist . All share the same theme of "the world is better than you think".